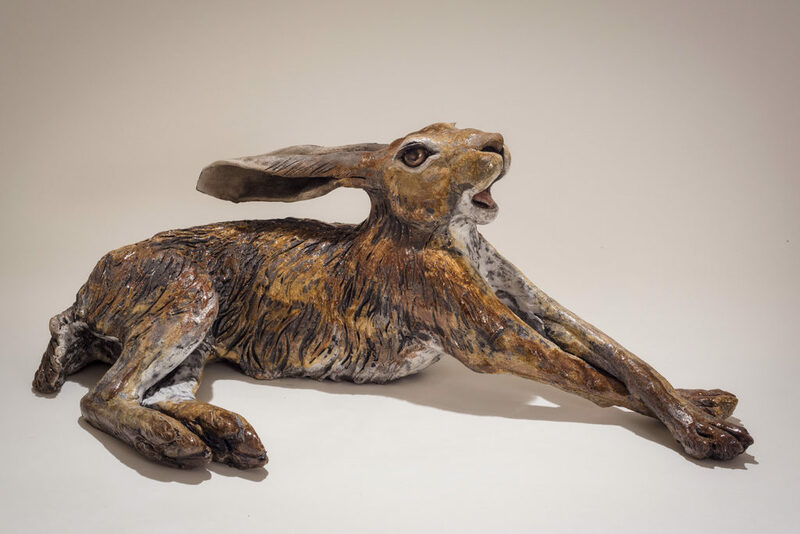 'Brief Encounter' (detail) E1. 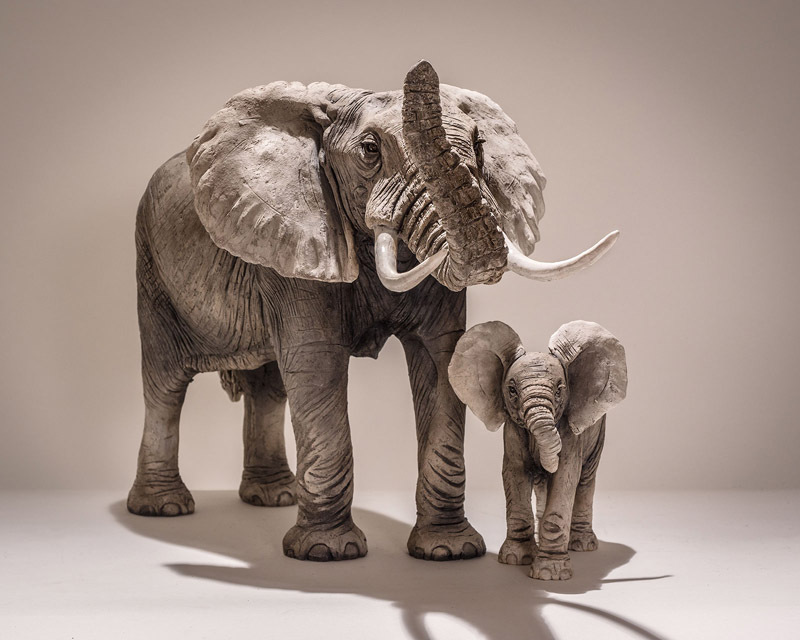 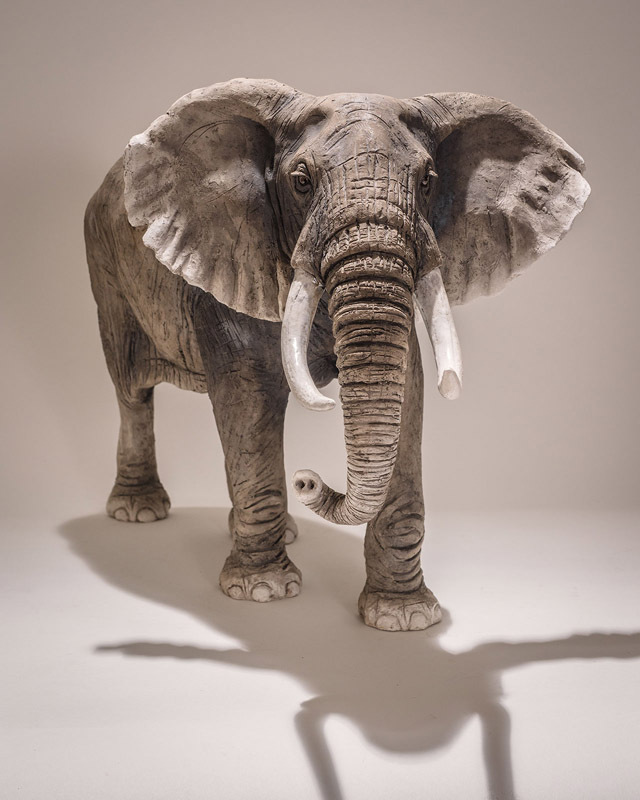 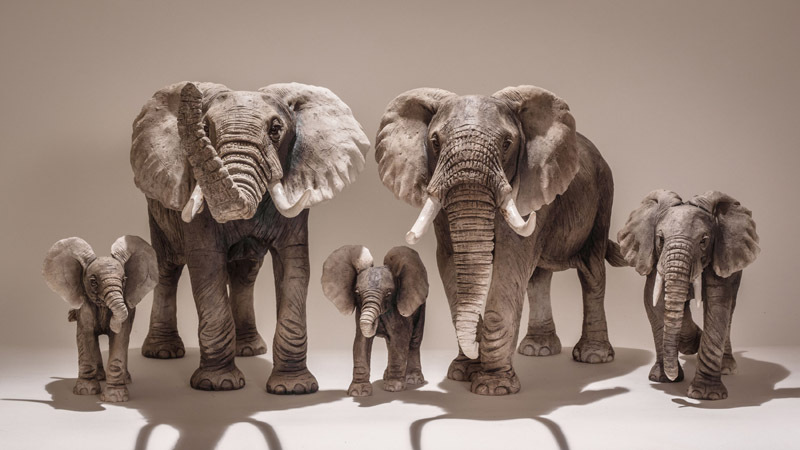 Large Adult Elephant, Low-fired ceramic L65 x 36 cm. 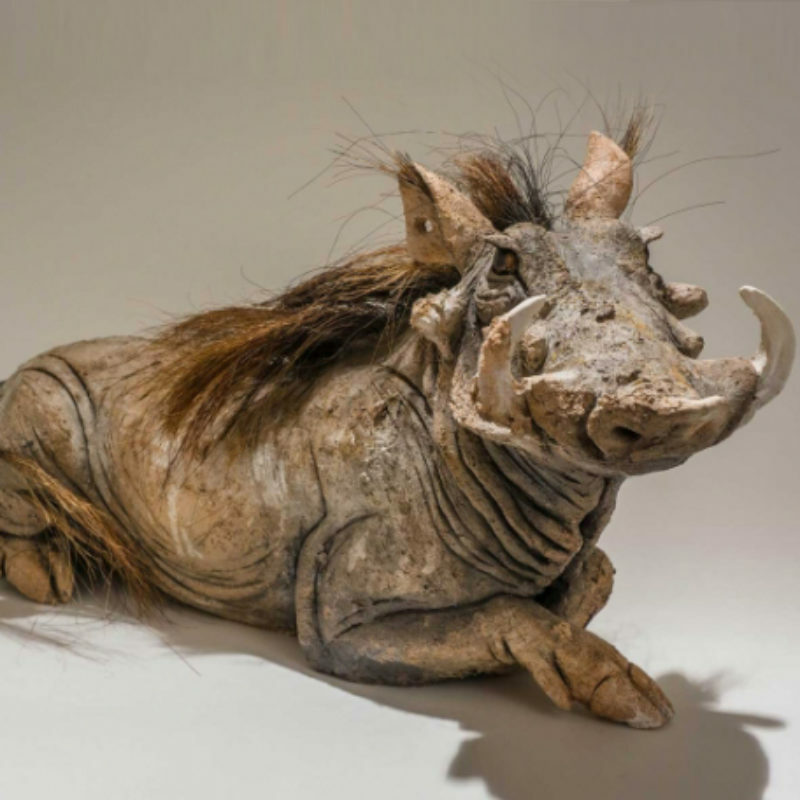 Warthog 'You Lookin' at Me? 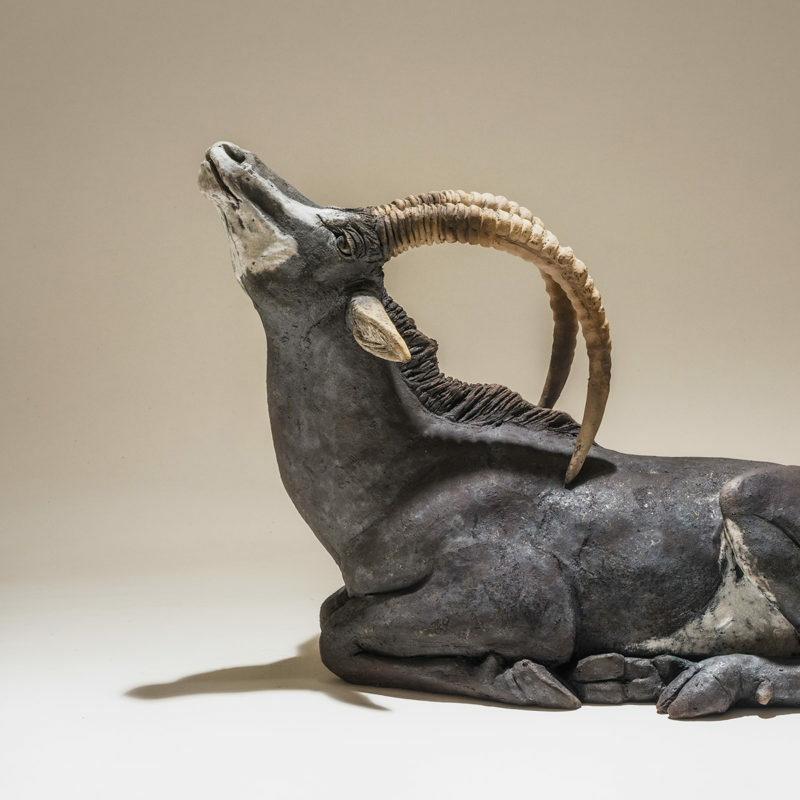 ', Low-fired ceramic 20 x 55 cm. 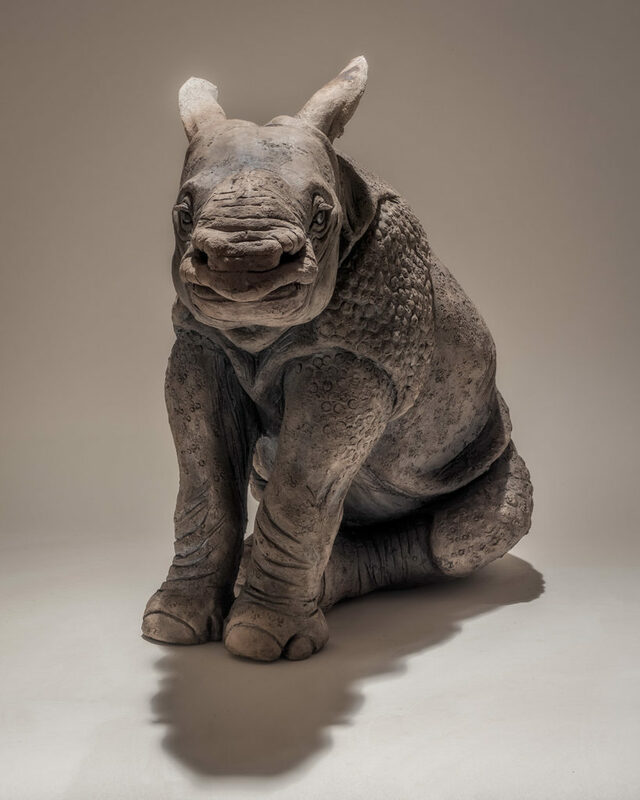 Indian Rhino Baby, Low-fired ceramic h33 x w22 x l42 cm. 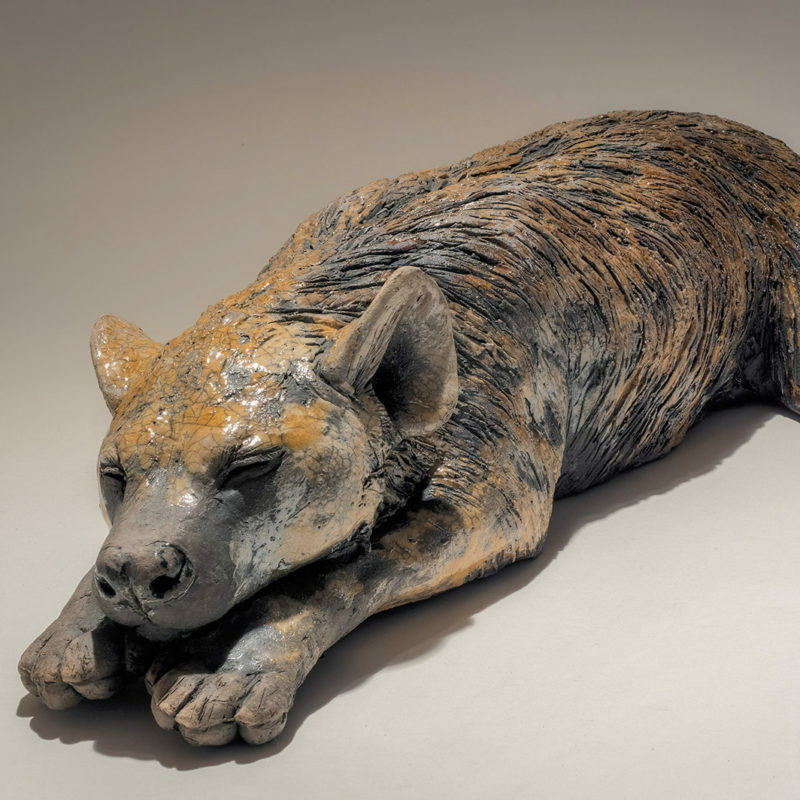 Spotted Hyena Cub Sleeping, Low-fired ceramic l56 x w19 x h12 cm. 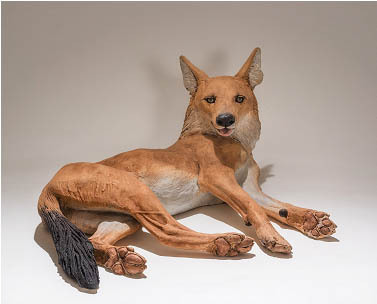 WDP1. 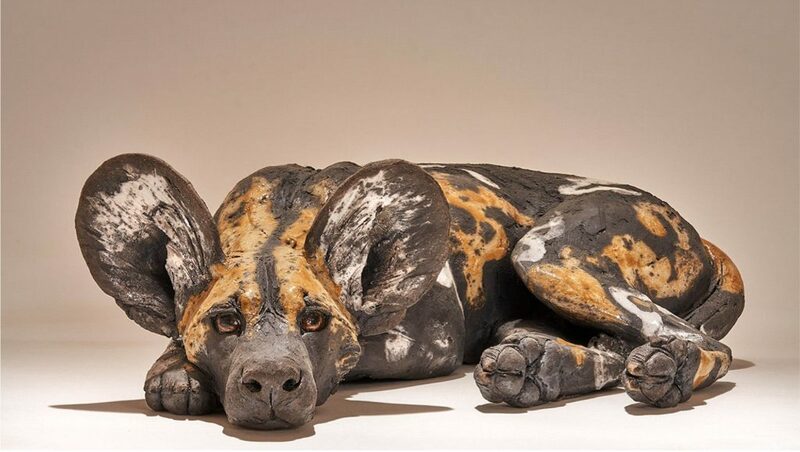 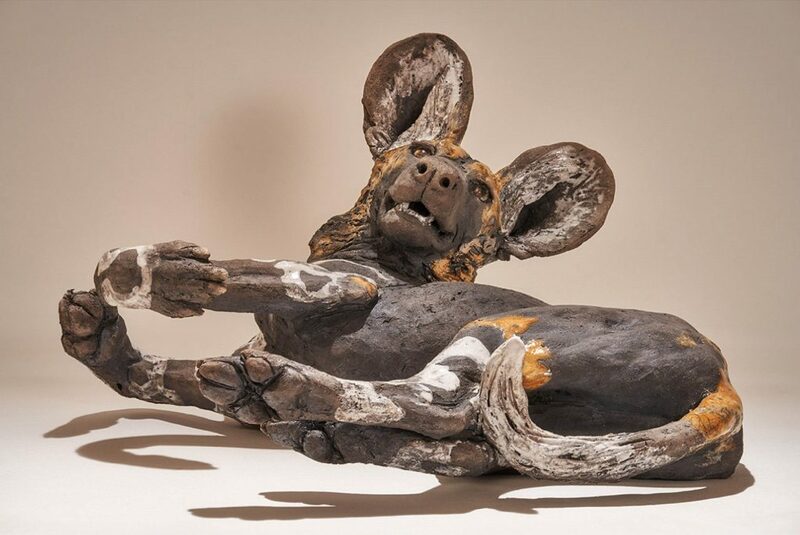 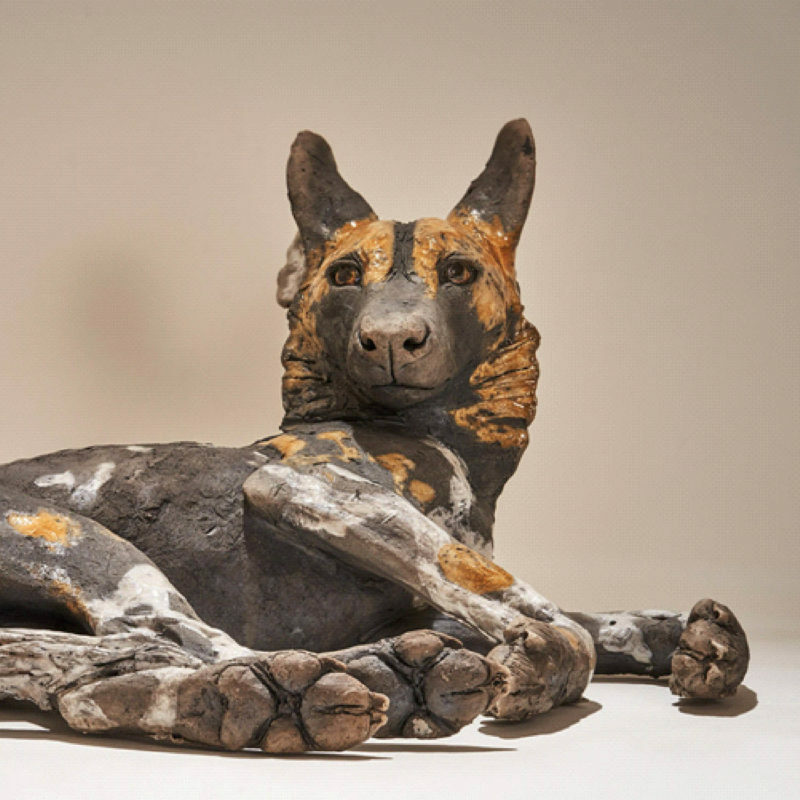 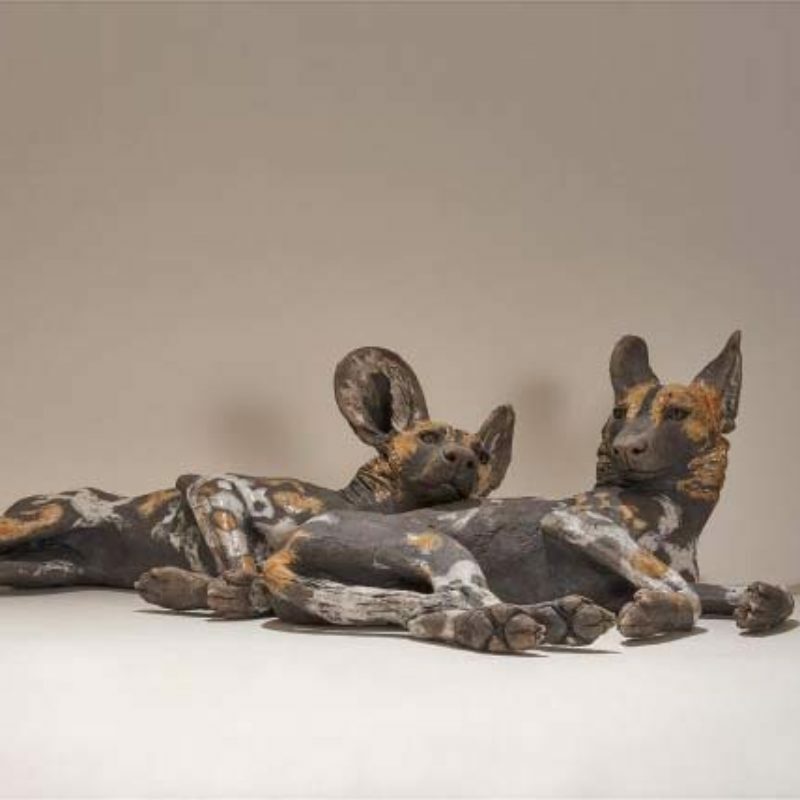 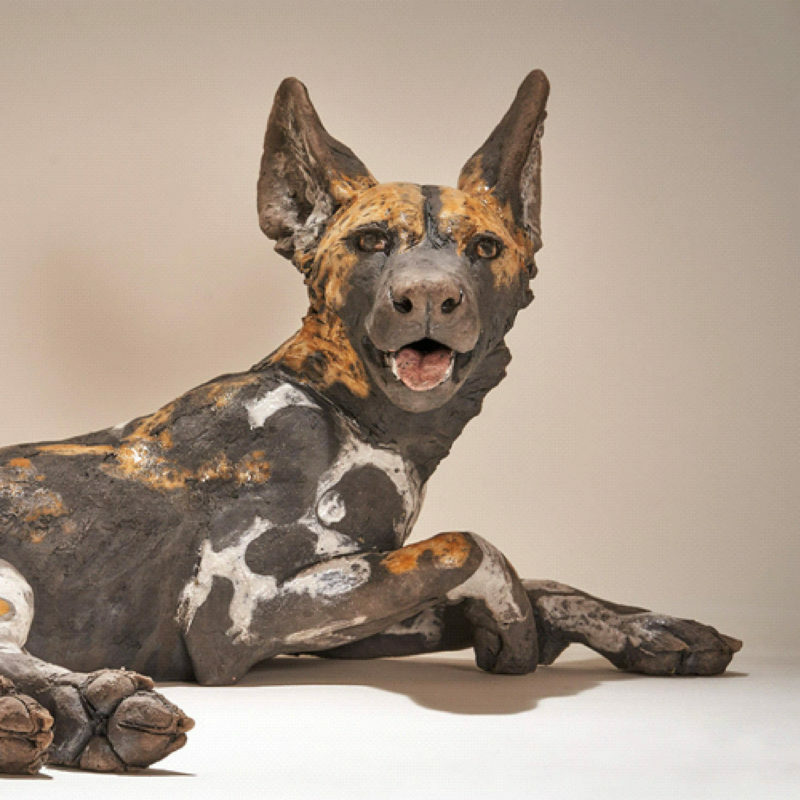 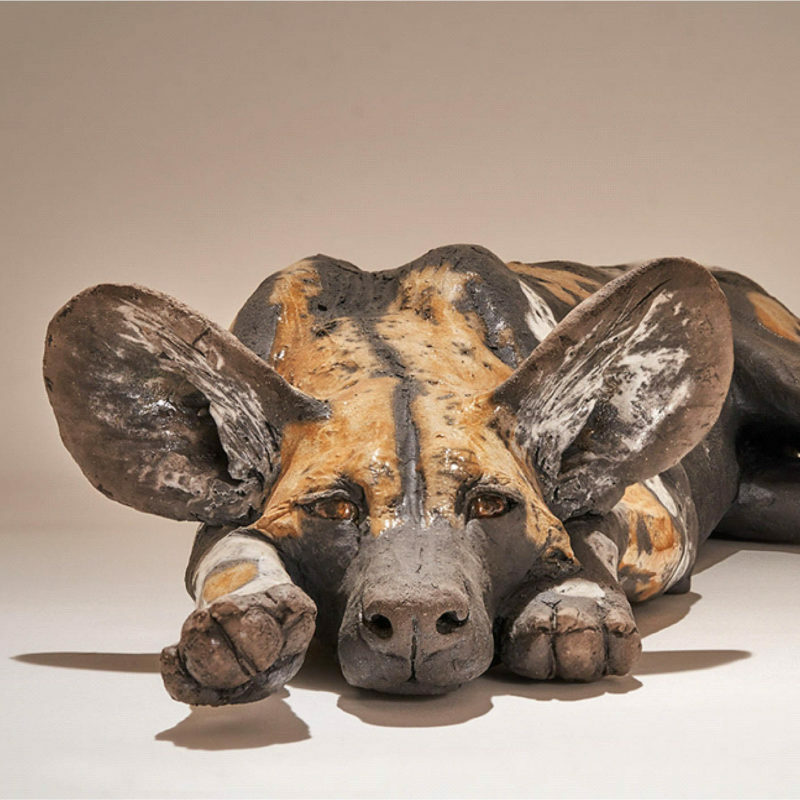 Wild Dog Lying, Low-fired ceramic L56 x h20 cm. 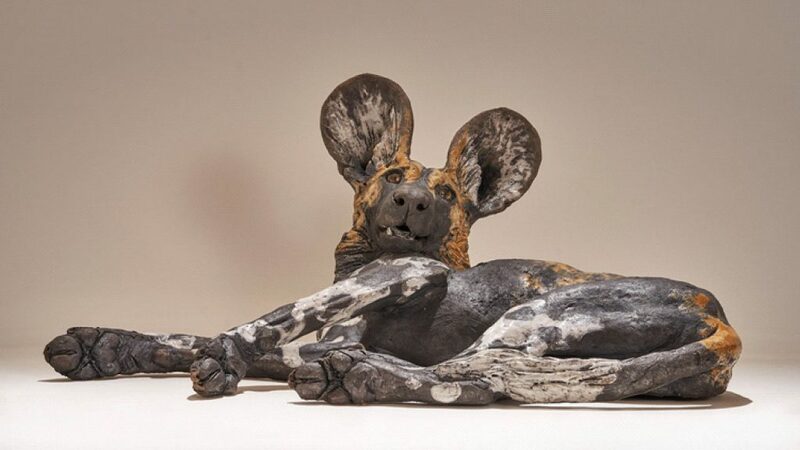 Wild Dog Pup #4, Low-fired ceramic L48 x w33 x h25 cm. 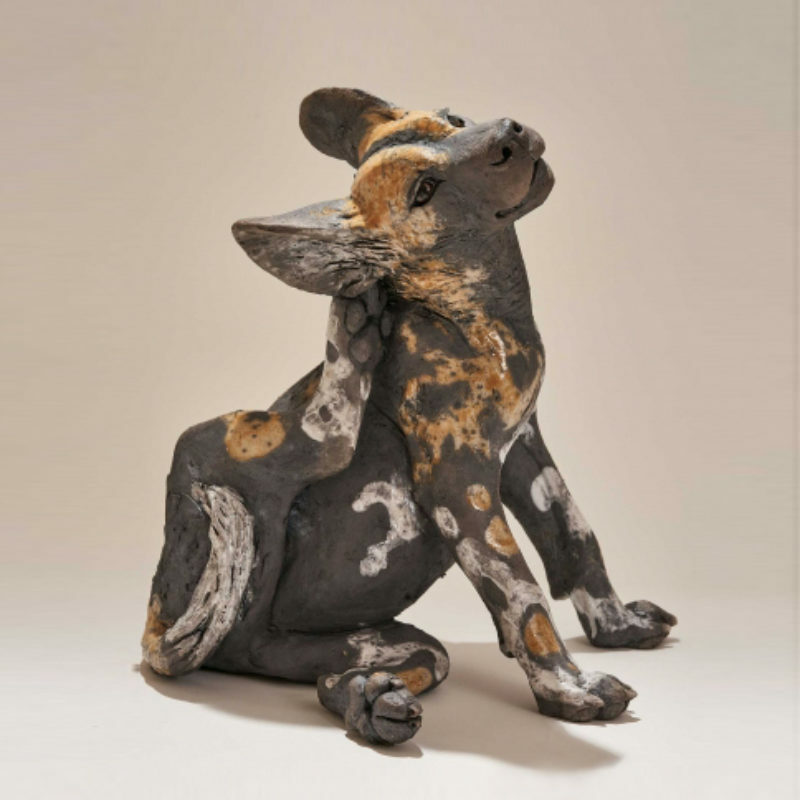 Wild Dog Pup #5, Low-fired ceramic L42 x w27 x h12 cm. 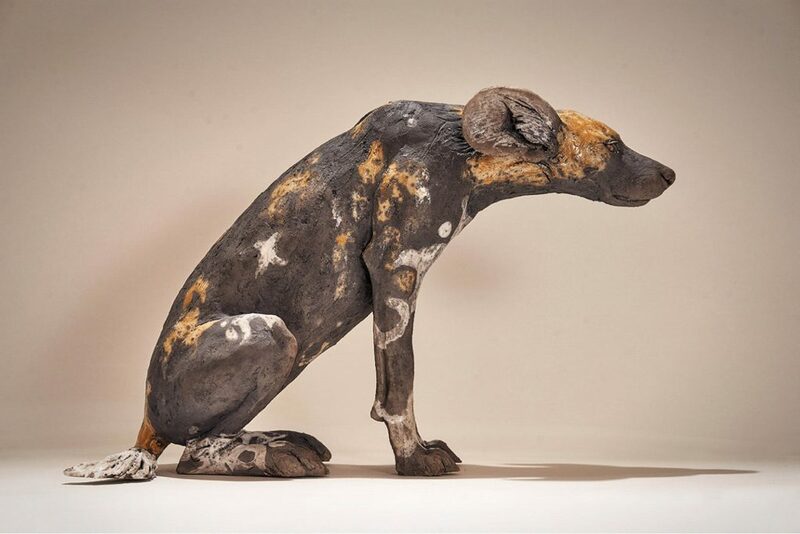 Wild Dog Pup #2, Low-fired ceramic L41 x w33 x h20 cm. 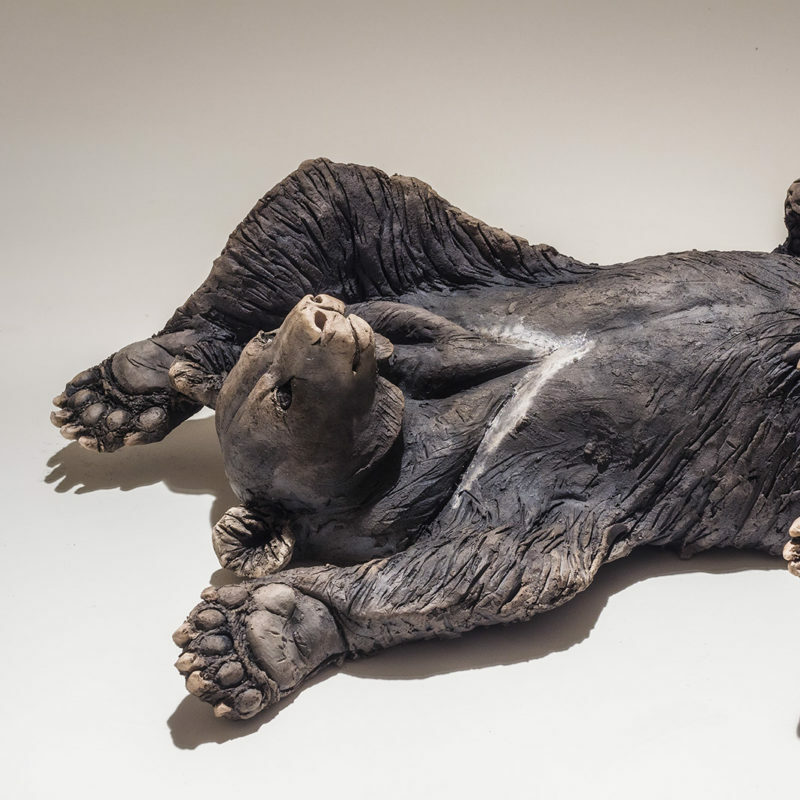 Moon Bear #1, Low-fired ceramic L48 x w21 x h17 cm. 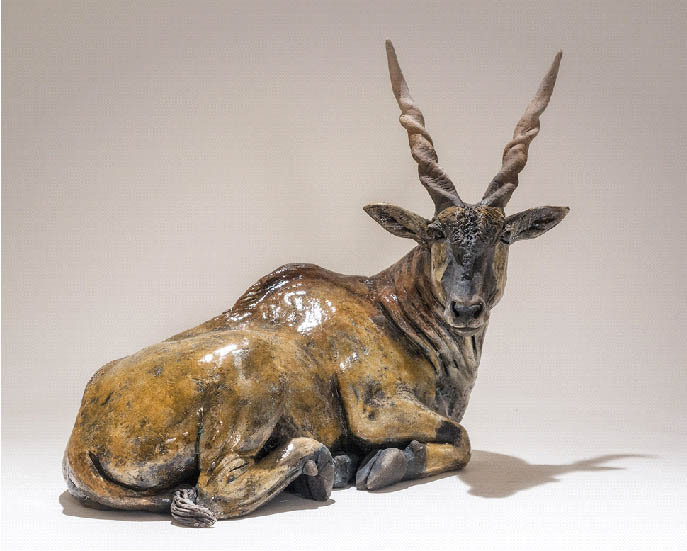 Sable Antelope, Low-fired ceramic L39 x w18 x h27 cm. 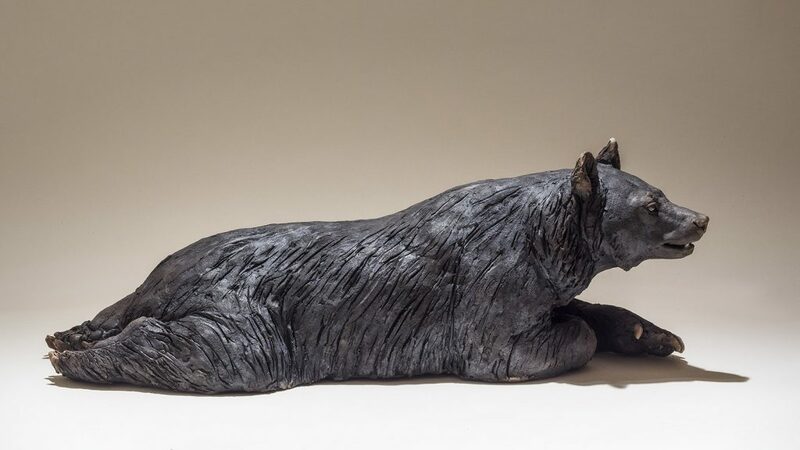 Moon Bear #2, Low-fired ceramic L44 x w28 x h13 cm. 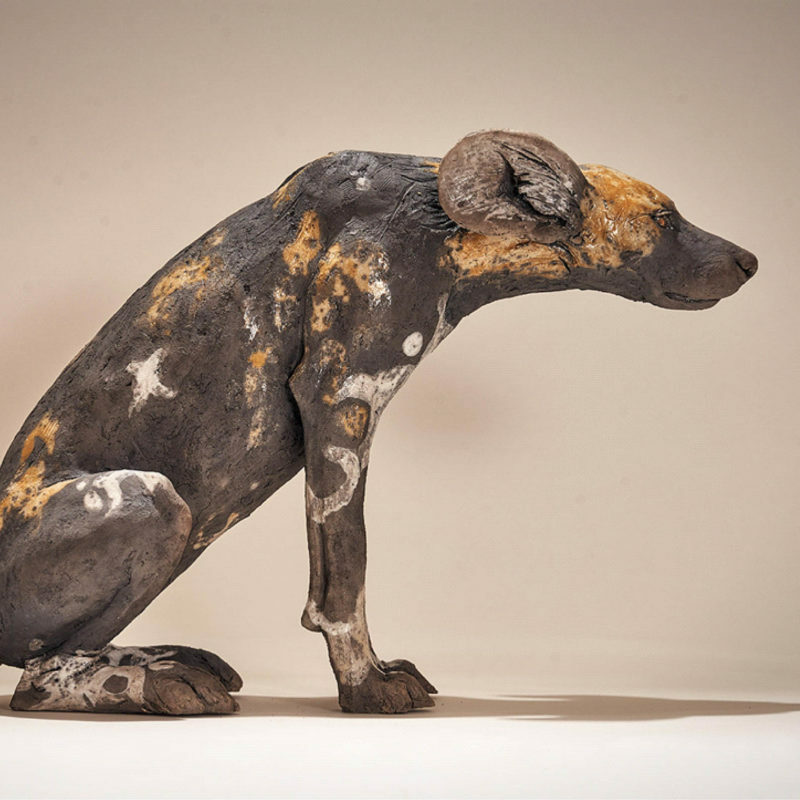 Wild Dog Pup #9, Low-fired ceramic L44 x w18 x h30 cm. 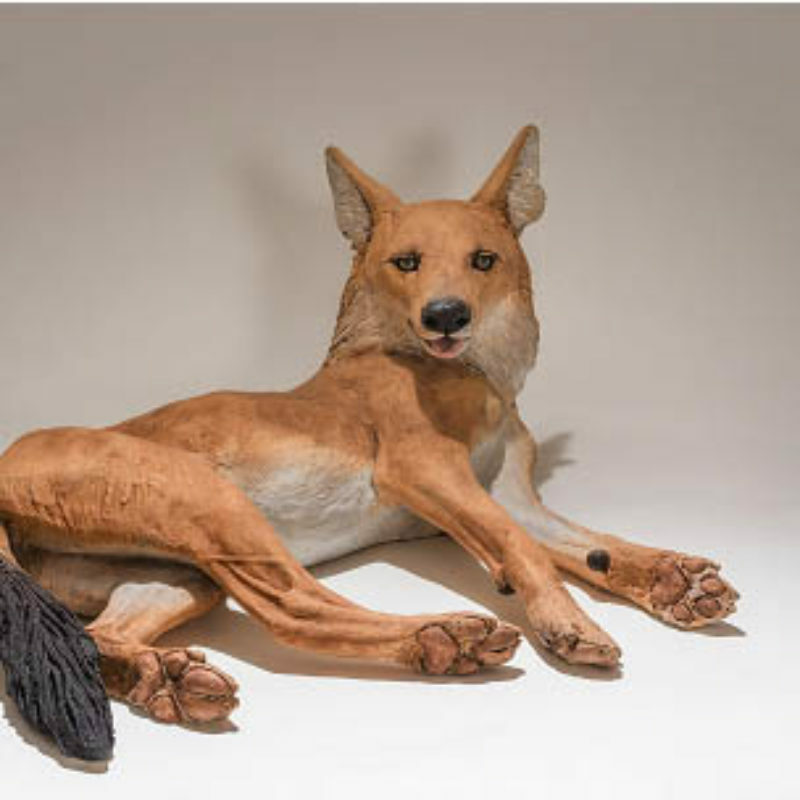 E4. 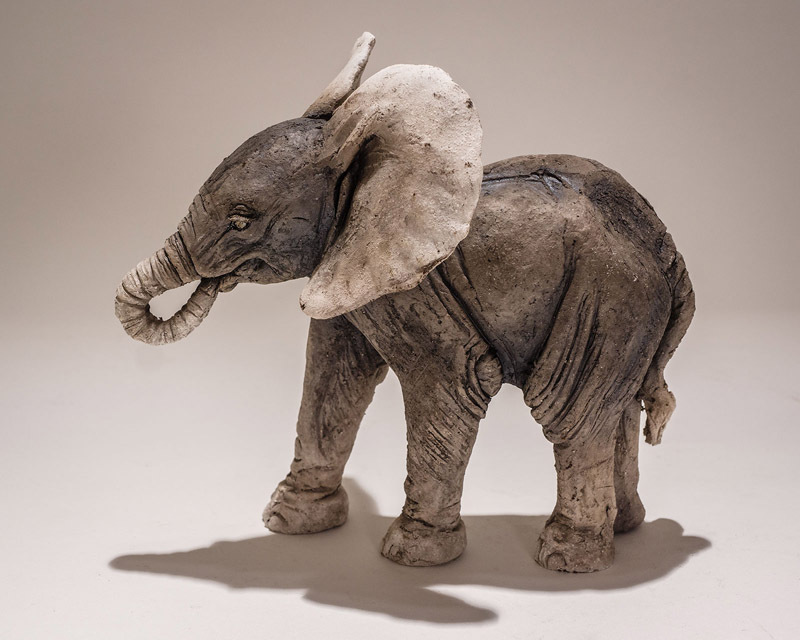 Baby Elephant, Low-fired ceramic L28 x h16 cm. 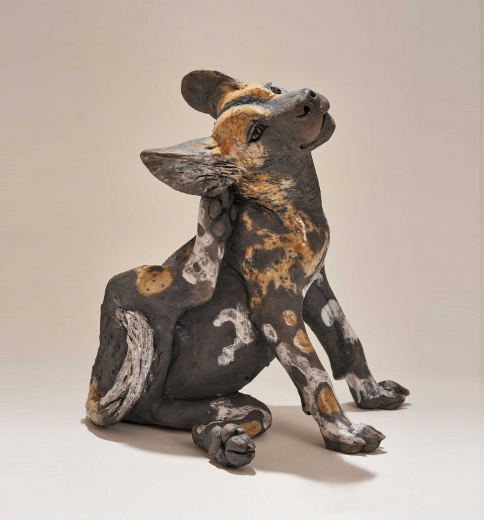 Wild Dog Pup #7, Low-fired ceramic L50 x w27 x h10 cm. 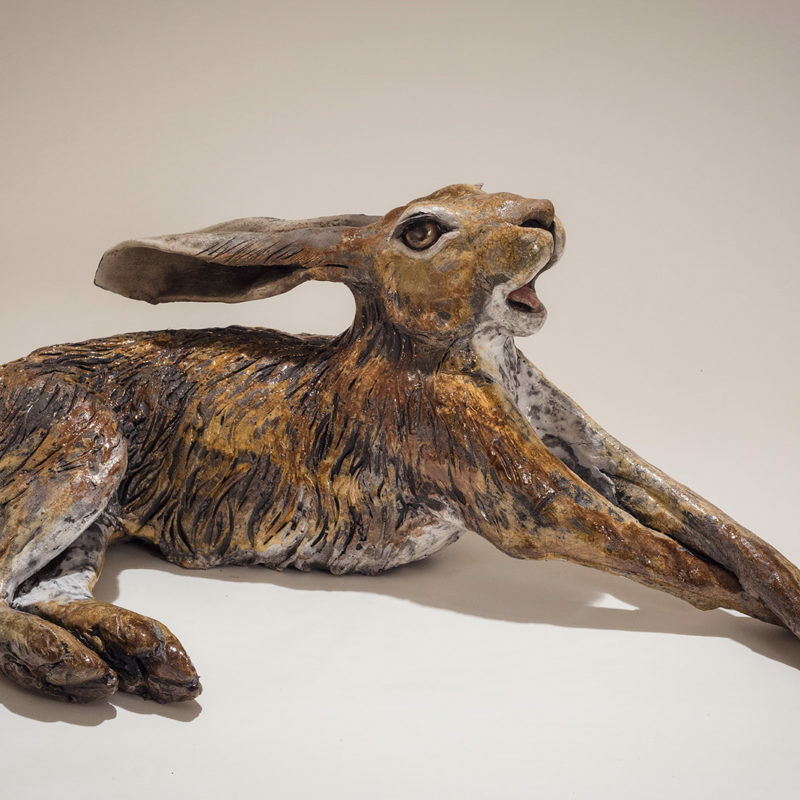 Nick Mackman Stretching Hare, Low-fired ceramic h21 x L55 x W30 cm. 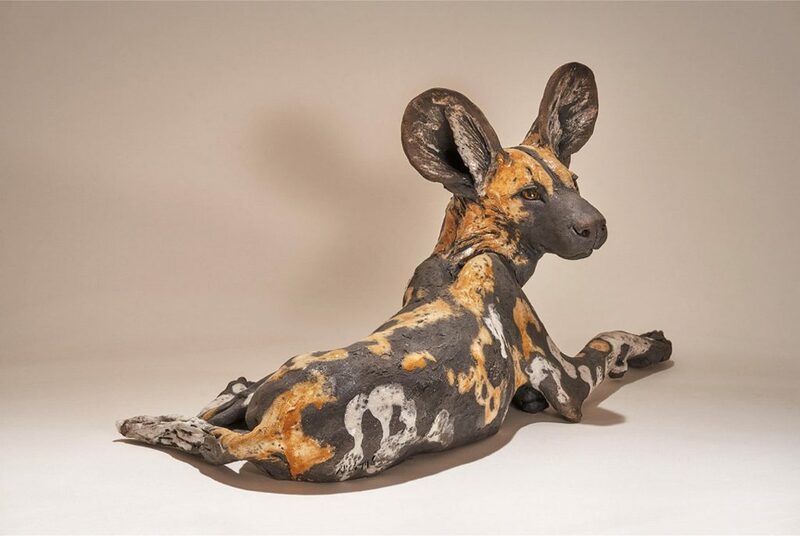 Dhole #2, Low-fired ceramic L35 x h20 x d35 cm. 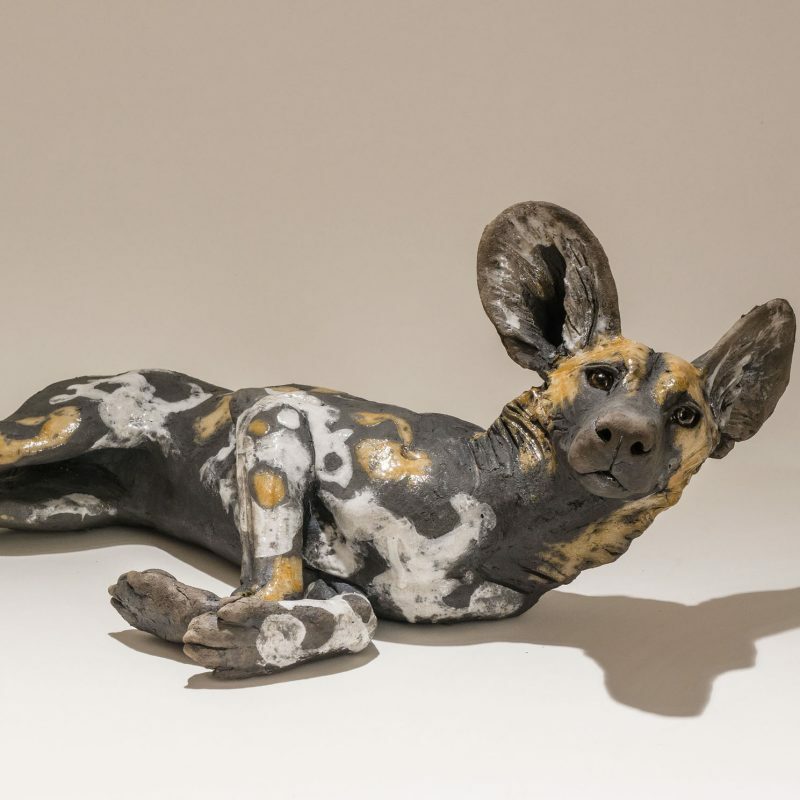 Wild Dog Pup #11, Low-fired ceramic L36 x w37 x h20 cm. 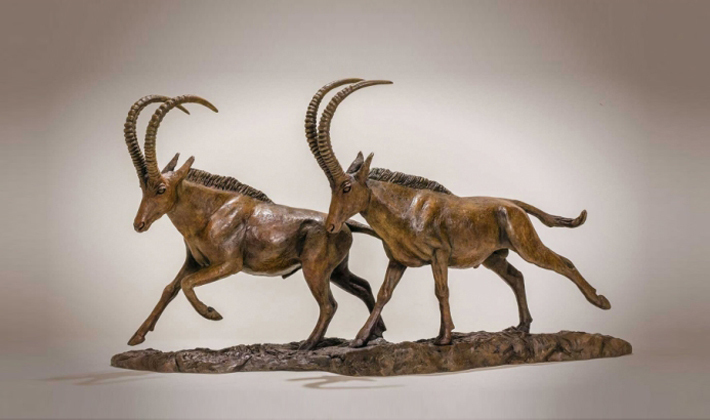 Sable Antelopes, Bronze Ed. 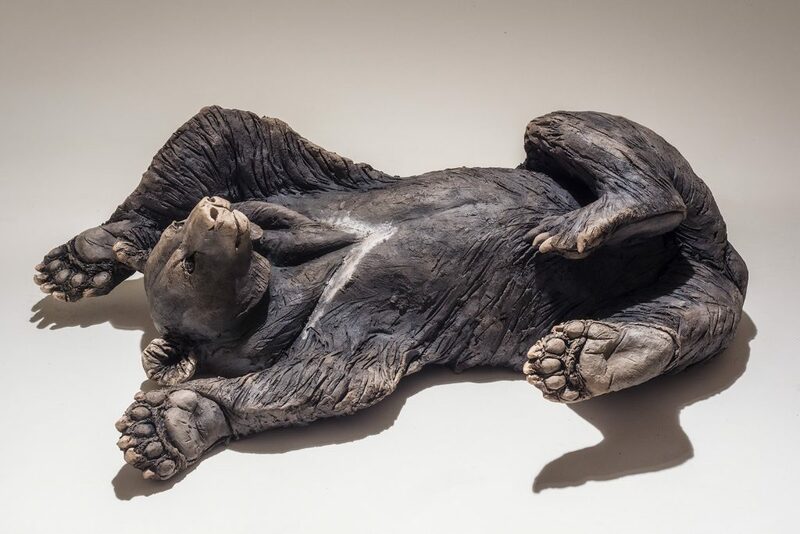 of 9 h25 x 75 cm. 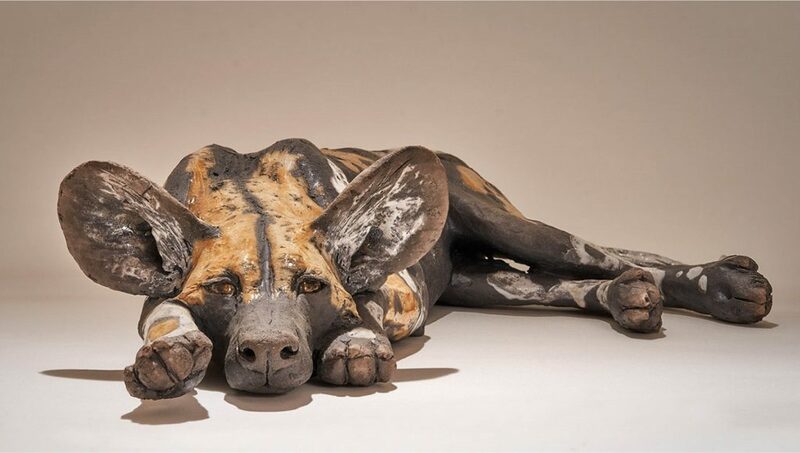 Wild Dog Pup #8, Low-fired ceramic L45 x w33 x h21 cm. 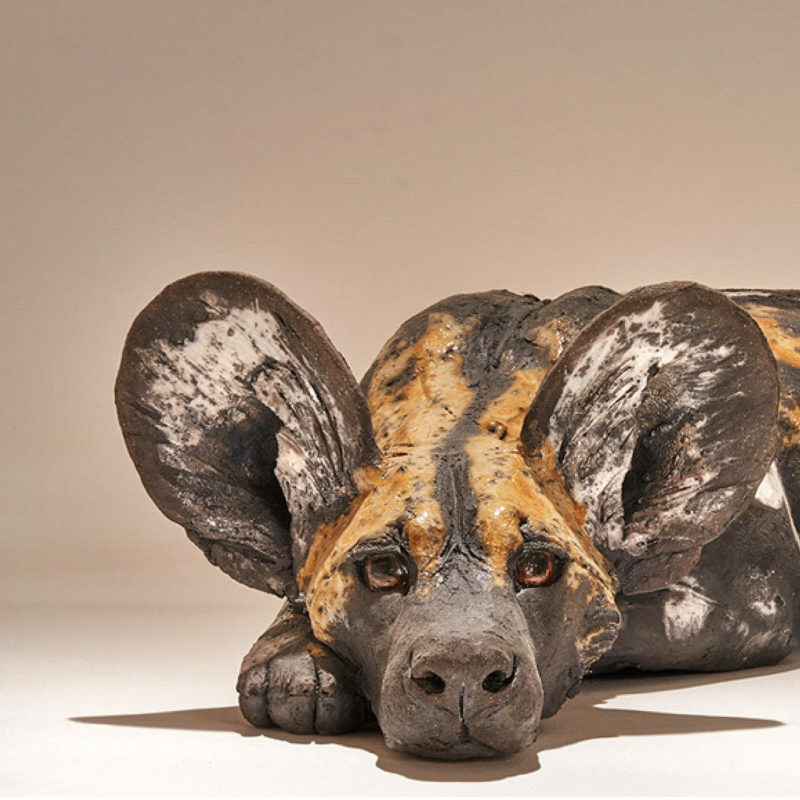 Wild Dog Pup #6, Low-fired ceramic L42 x w32 x h23 cm. 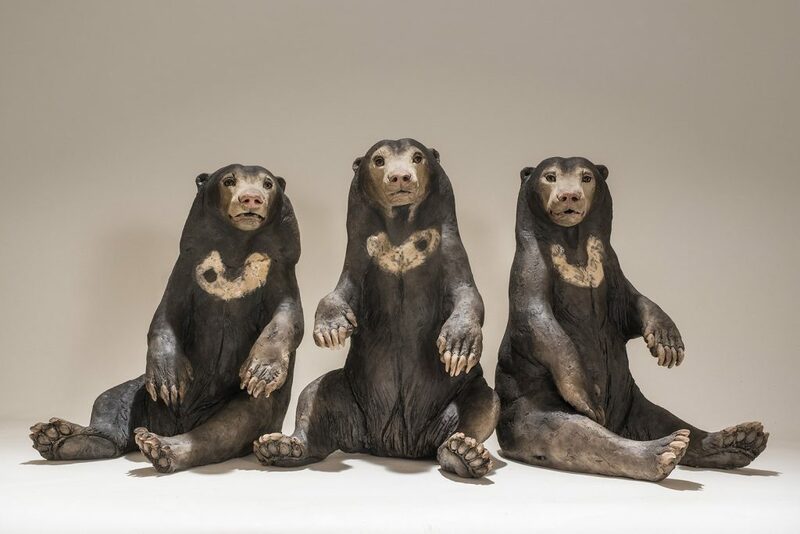 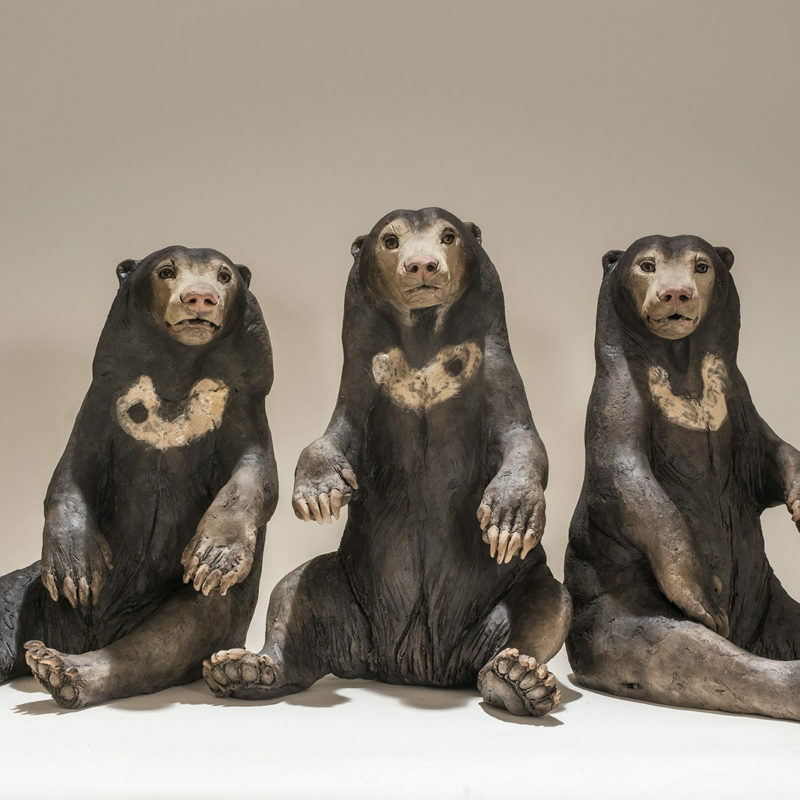 Sun Bears, Low-fired ceramic from left: Bear #1 L26 x w32 x h31 cm; Bear #2 L26 x w25 x h34 cm; Bear #3 L31 x w27 x h32 cm. 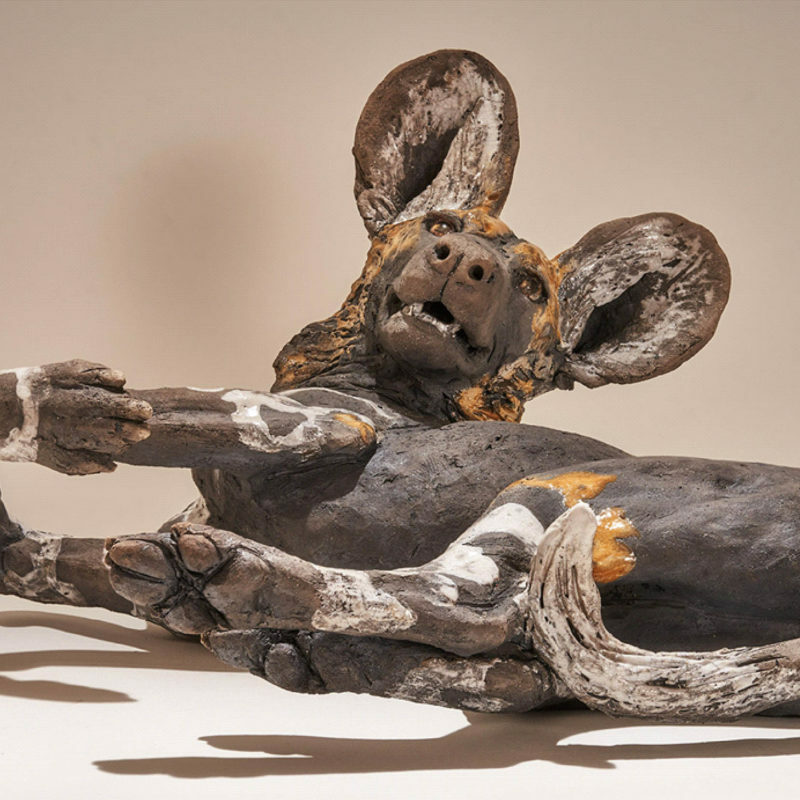 Wild Dog Pup 'That Feels Good', Low-fired ceramic 30 x 45 cm. 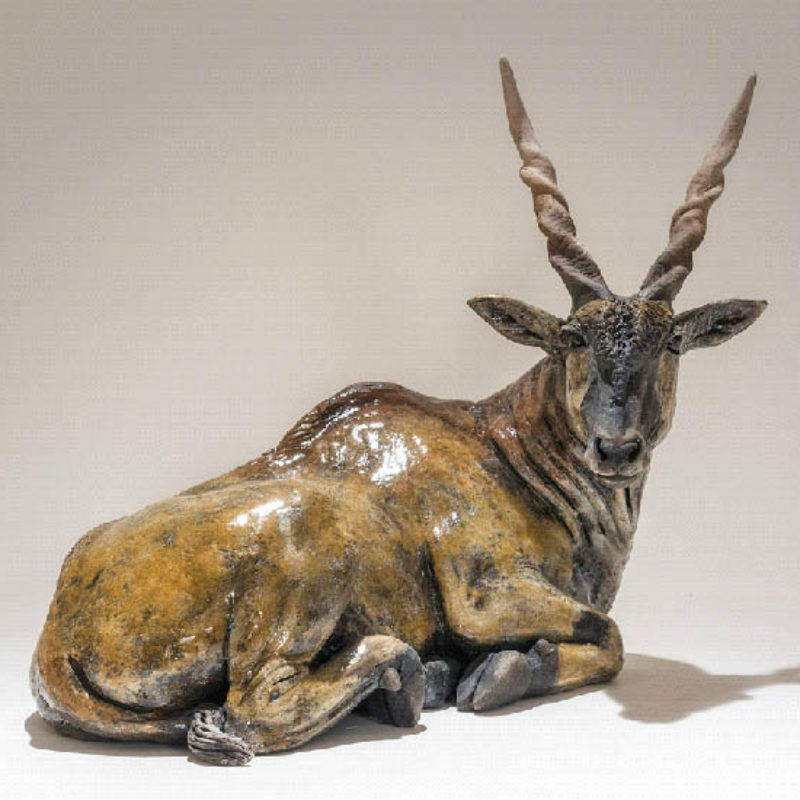 Winner of Wildlife Artist of the Year, Mall Galleries London. 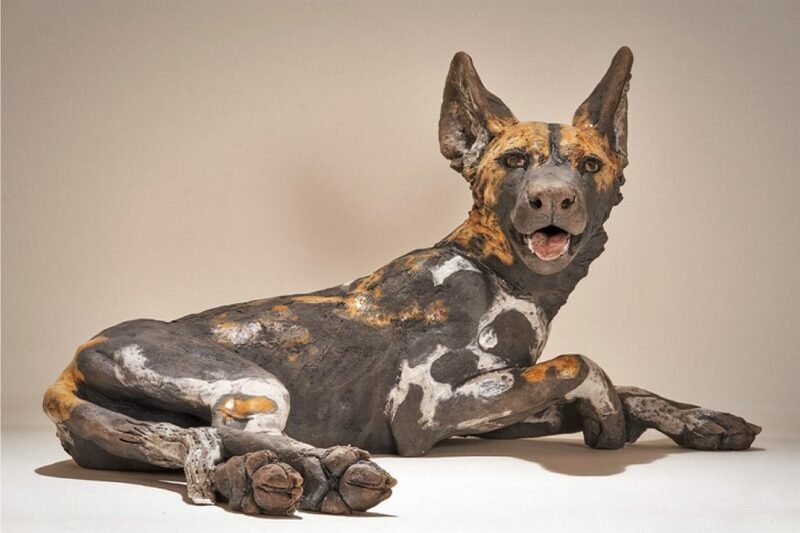 1993 “Trudy Norman Award” for achievement during H.N.D. 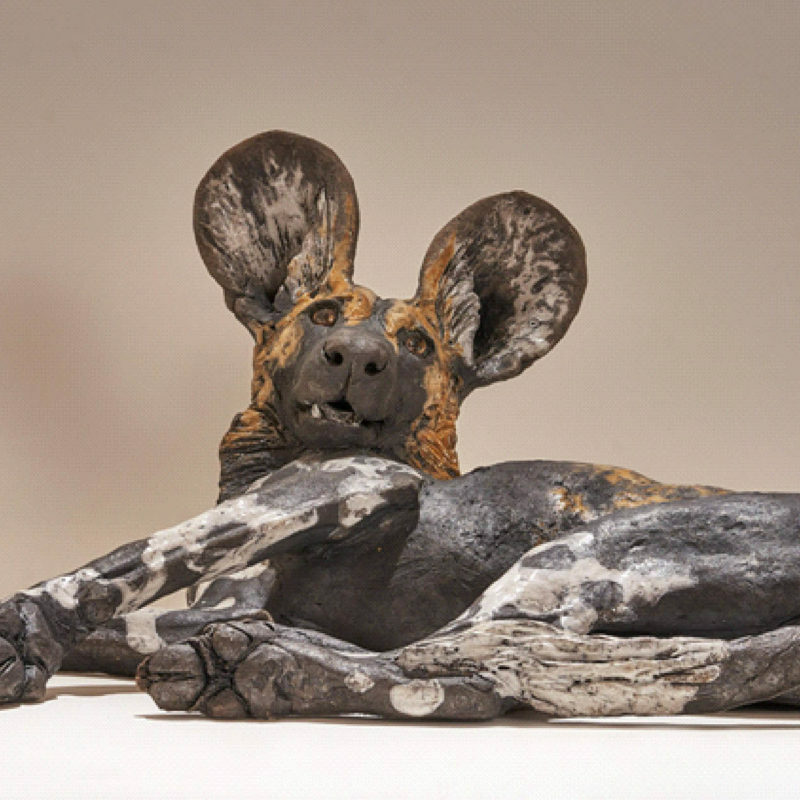 Nick Mackman is a sculptor of one-off clay animal models. 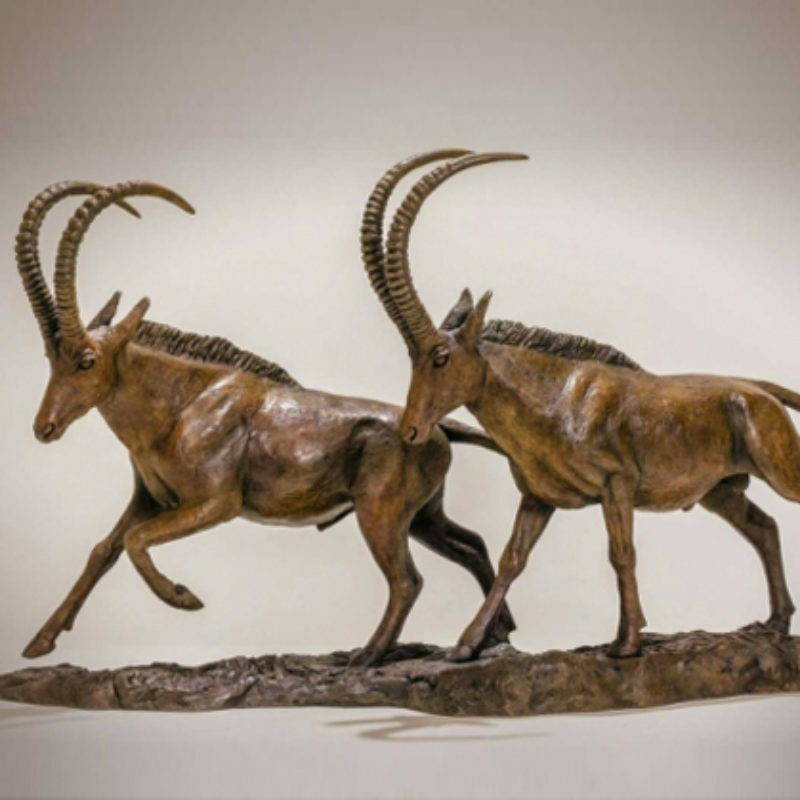 She has been widely exhibited and in 2010 she won the Open Category in the Wildlife Artist of the Year competition. 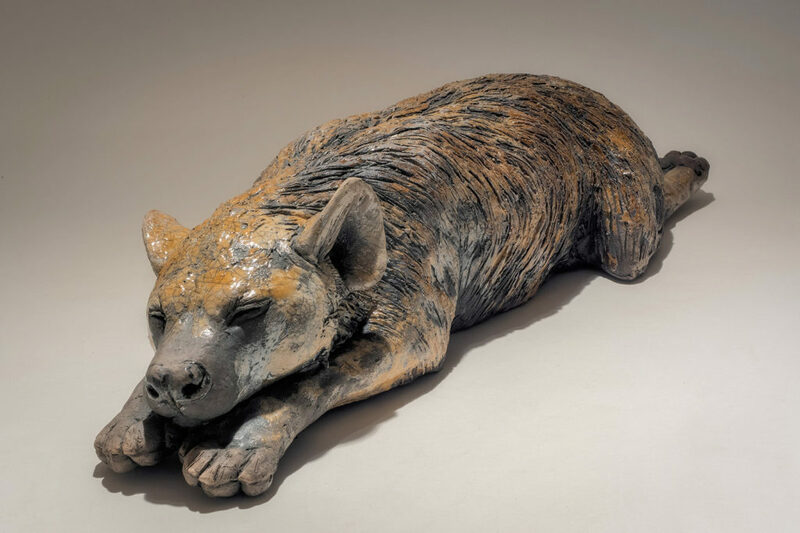 Most of her pieces are Raku fired, giving a rich but natural crackle glaze. 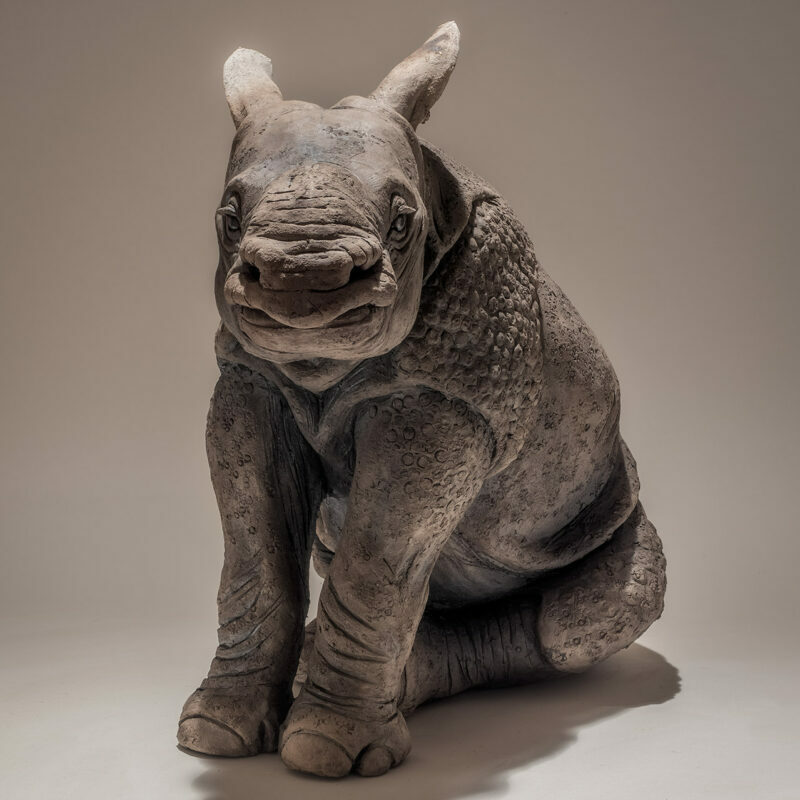 Drawing on her experience as a rhino keeper and on safari, she aims to get under the skin of the animal, giving each animal sculpture its own personality. 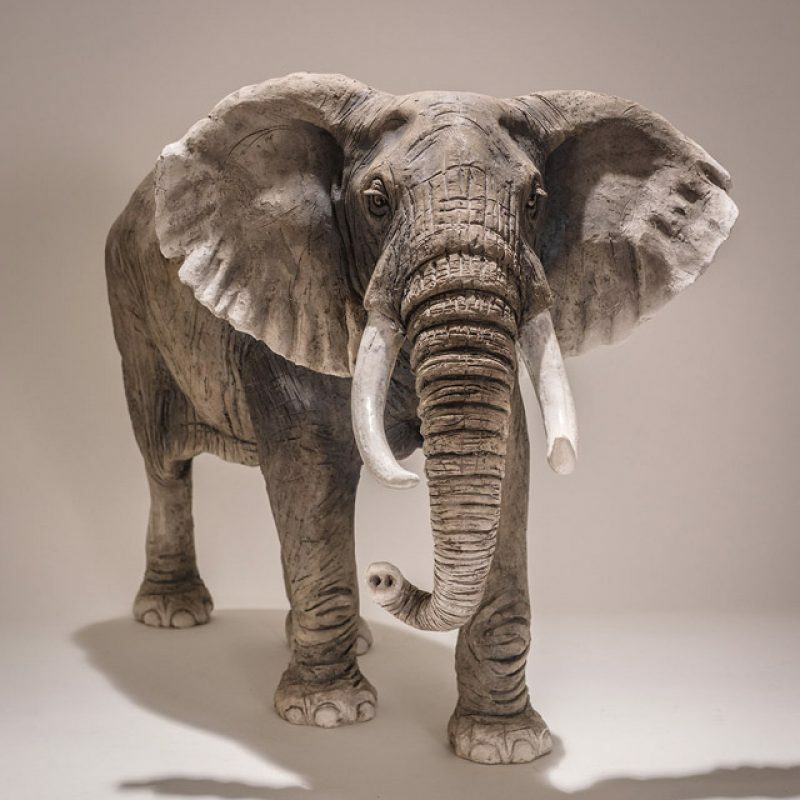 Many of her subjects are highly endangered and she aims to enlighten us to their beauty, humour and tenderness, even though they may be largely perceived as ugly or aggressive. 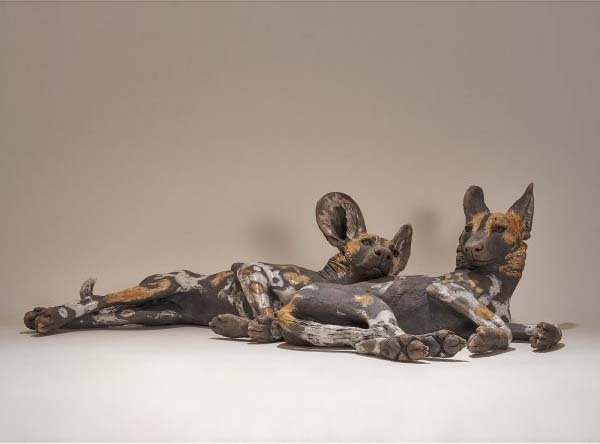 She lives in Devon, in South West England, with her husband, twin children and two dogs. 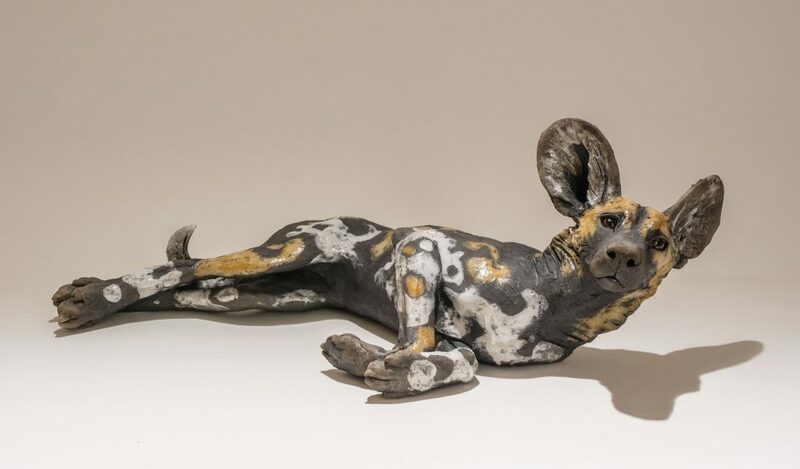 Nick’s animal sculptures have been widely exhibited and over the years her animal models have found homes with, amongst others, John Cleese, Judi Dench, Chris Packham, David Shepherd and Viscountess Serena Linley. 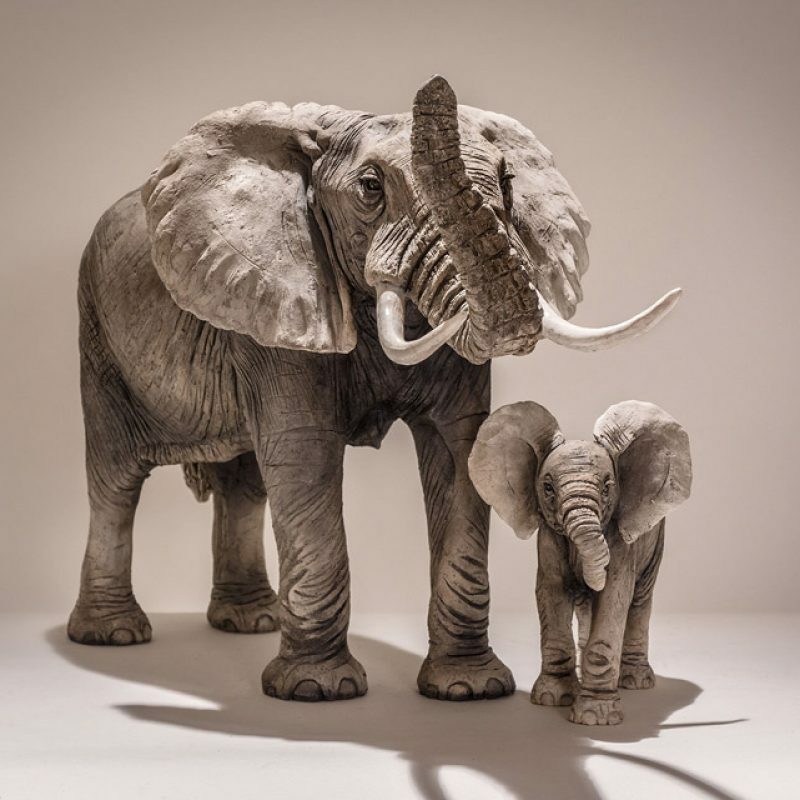 She has accepted commissions from British Airways and the Wildlife Photographer of the Year competition, making trophies for the award winners. 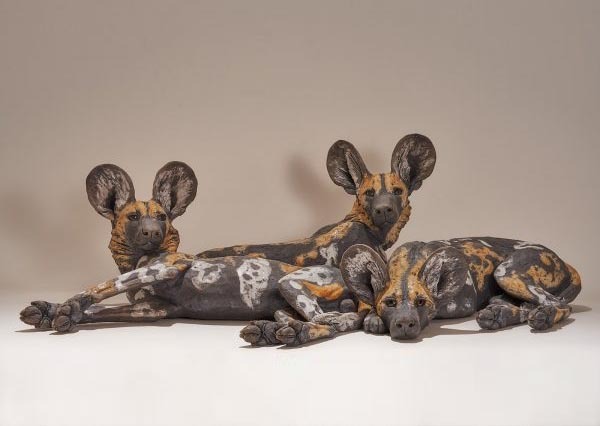 Nick Mackman’s animal models and wildlife sculptures are based on detailed observations and careful study. 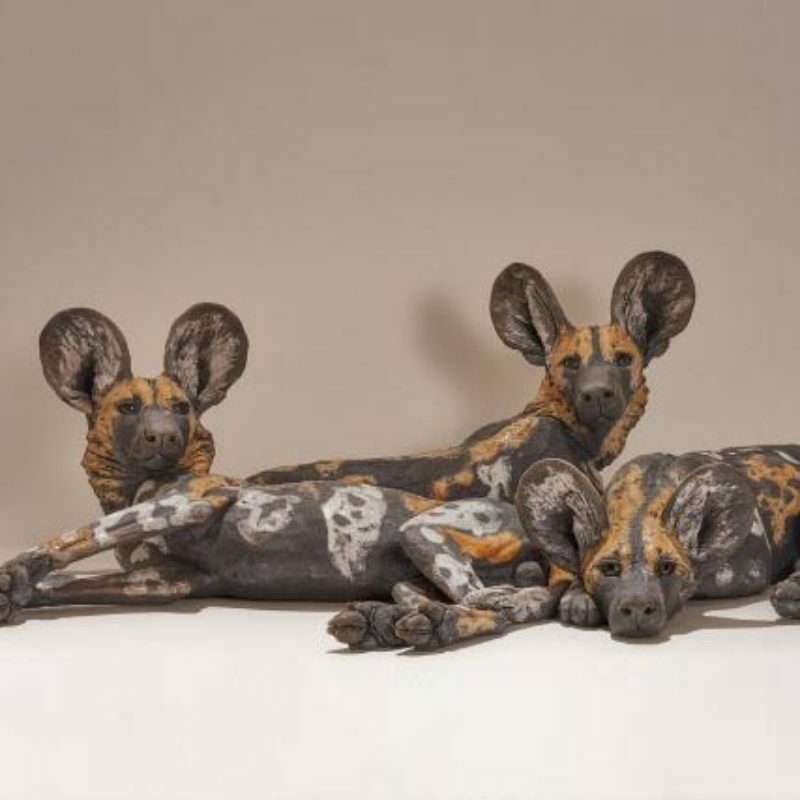 She has travelled on safari in Botswana, Madagascar and Nepal to observe animals in the wild, making sketches and photographs of her subjects. 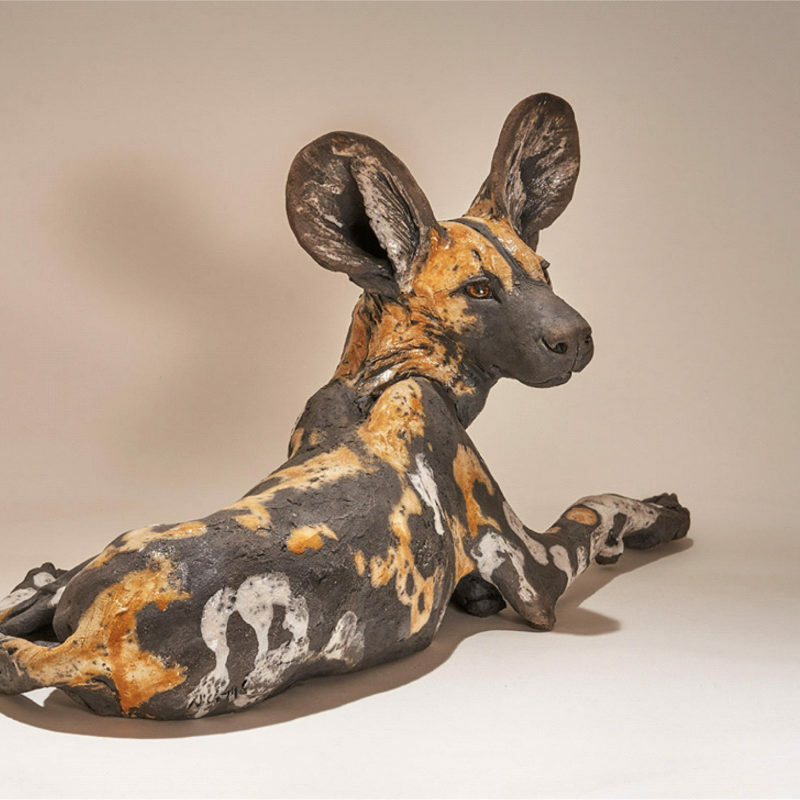 In 2010 she was invited by the Bushcamp Company to visit the Luangwa National Park in Zambia. 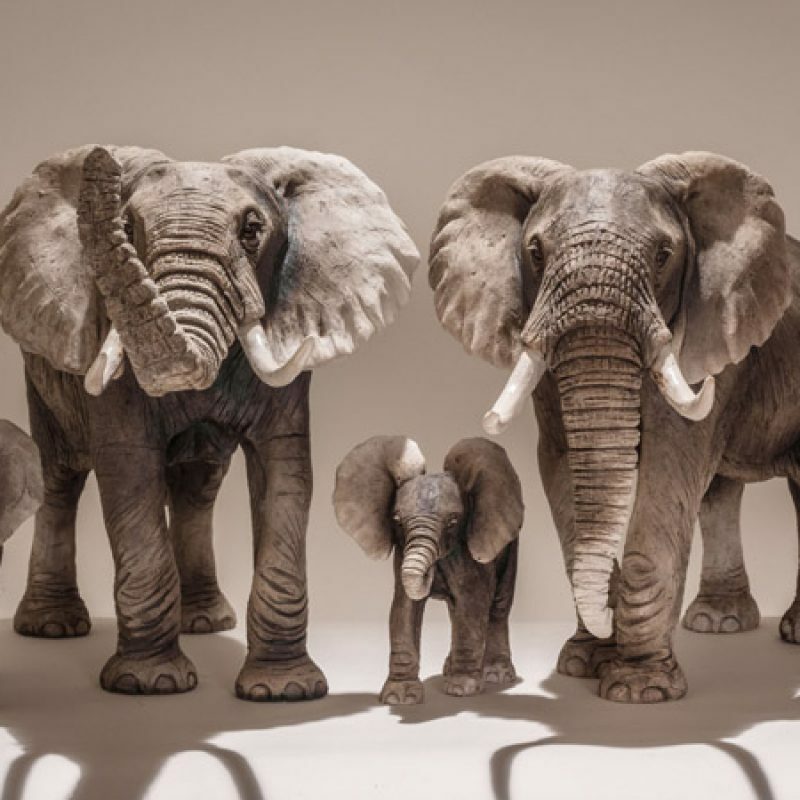 The company’s Mfuwe lodge is known for the elephants which regularly wander through the lobby! 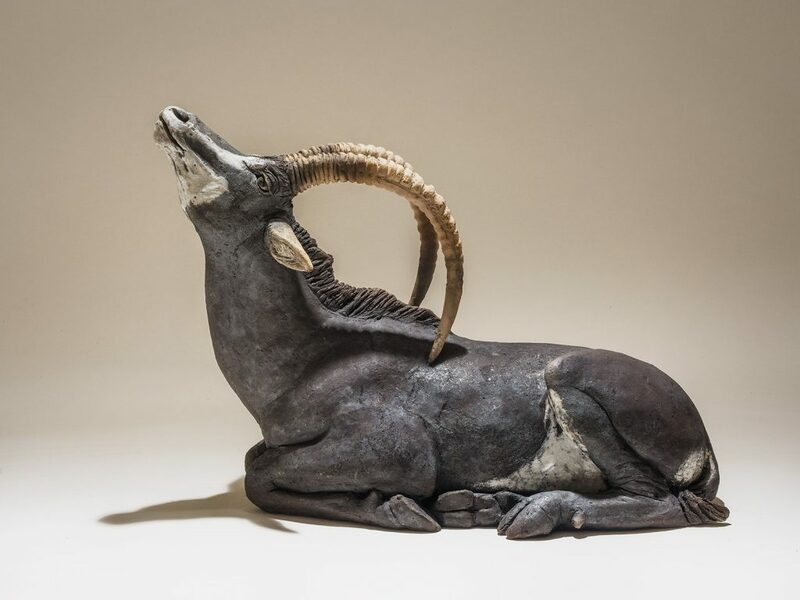 The majority of Nick Mackman’s animal sculptures are slab built using a clay called T’Material, a type of porcelain with added molochite. 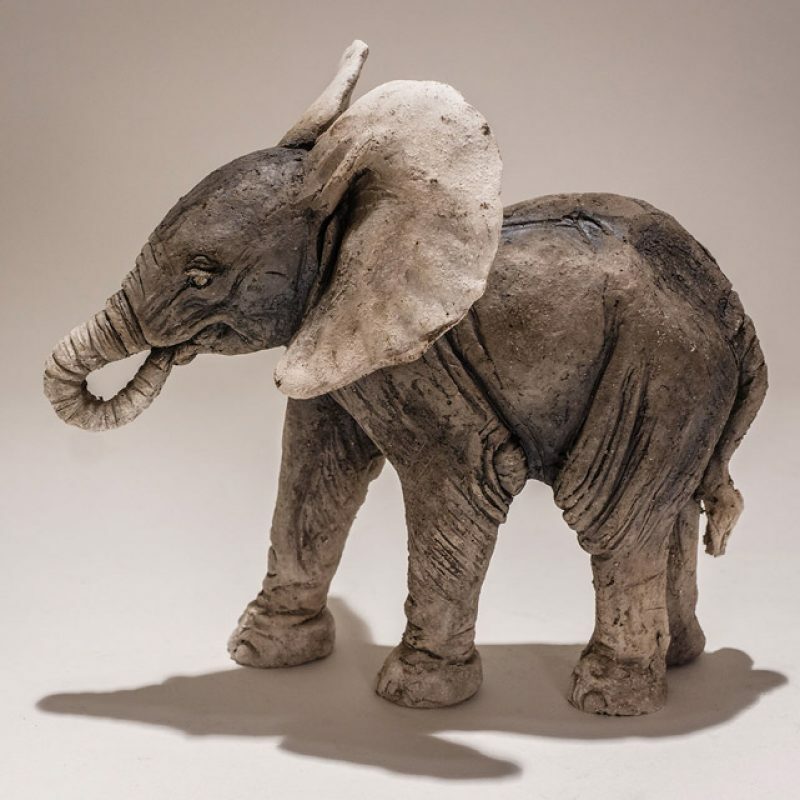 Paper pulp is added to the clay, creating paper clay, which has great strength and structure. 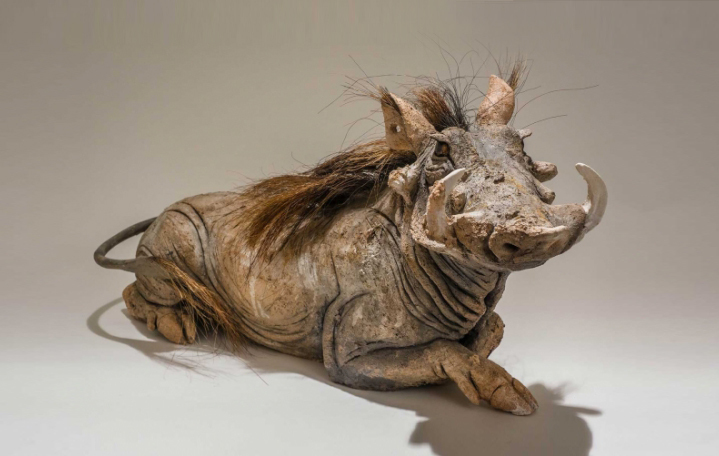 The paper pulp burns out in the firing so the finished animal model is very lightweight, opening up many sculptural possibilities. 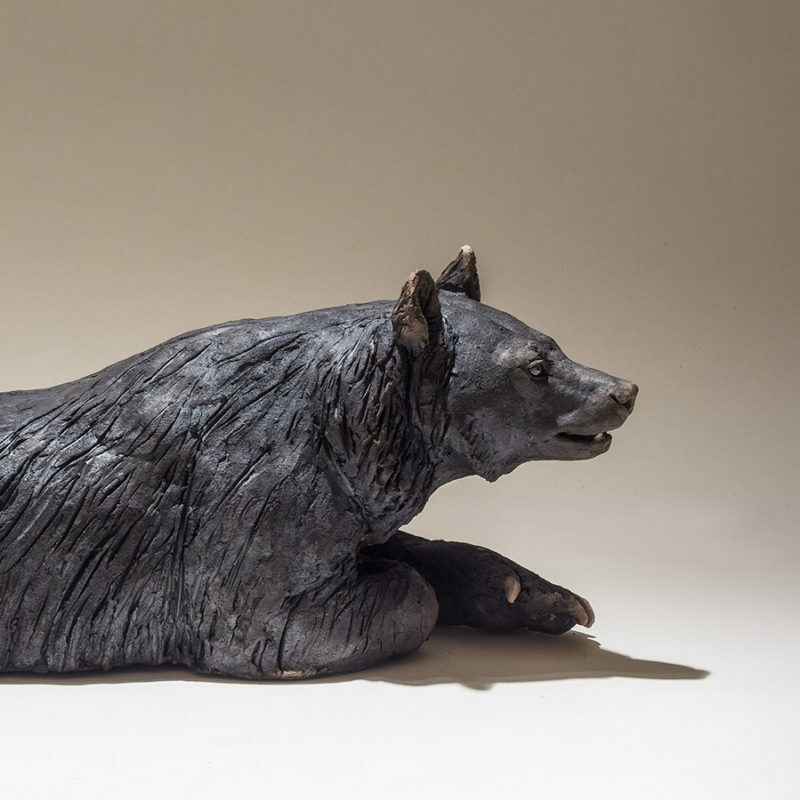 The Raku firing imparts the distinctive smoky finish used in most of her sculptures. 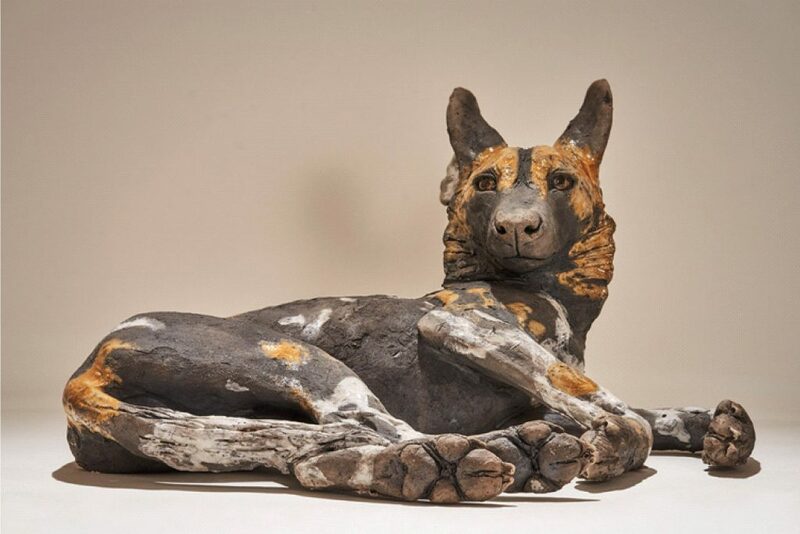 Bristles, papier maché and other media are sometimes used to complete the piece.